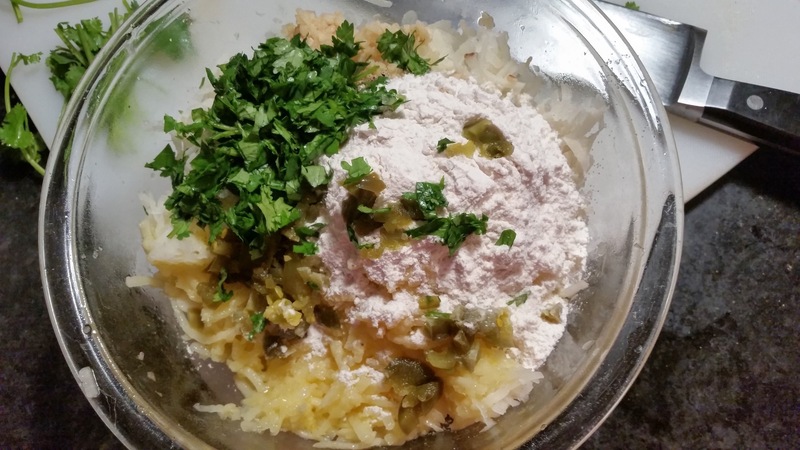 Cooking Light has been slaying it lately…..potatoes, fried, with jalapeños and cilantro?? Topped with a lime chipotle aoli? SHUT UP! 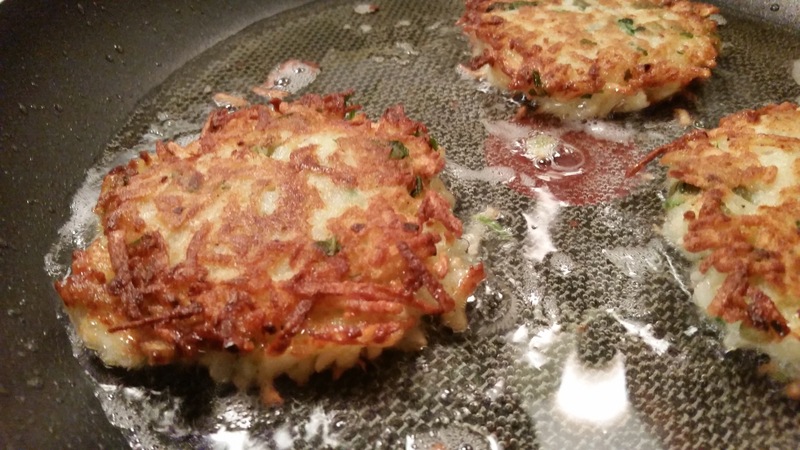 There just seemed to be a few key latke-making staples missing from the recipe. They called for the onion and potato to be grated in a food processor. Now, usually, that grating blade is a godsend but knowing you can’t expect crips results when the onion and potato are full of water, I wondered how this would work. Hand grating them, using a box grater, would yield a less watery mixture. No baking powder?? Frying in vegetable oil instead of a little bit of olive oil? These seemed like no-brainer basics but what the hell do I know. Just to confirm, I consulted with several other sources. The first was Chow.com. The recipe I read looked very similar to Cooking Light’s but I had a few more recipes to consult. 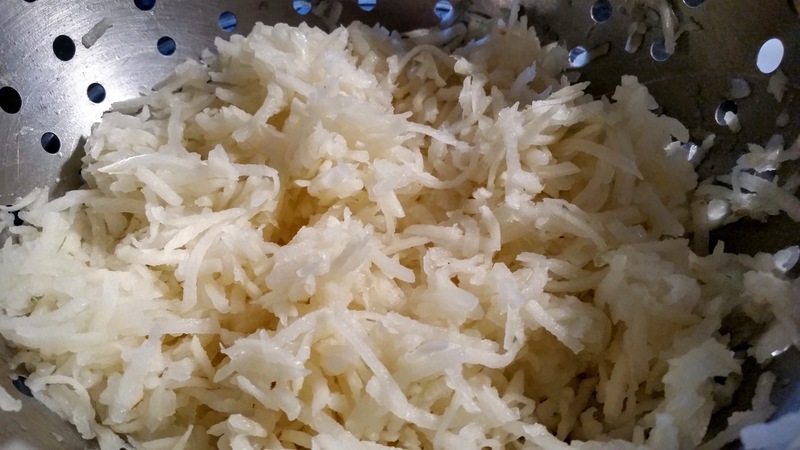 The majority suggested hand grating the potatoes and the ratio of onions to potatoes varied only slightly. Last, I threw it out to the FaceBook world and it was confirmed that adding baking soda, (and a few other goodies like milk), was the way to go. 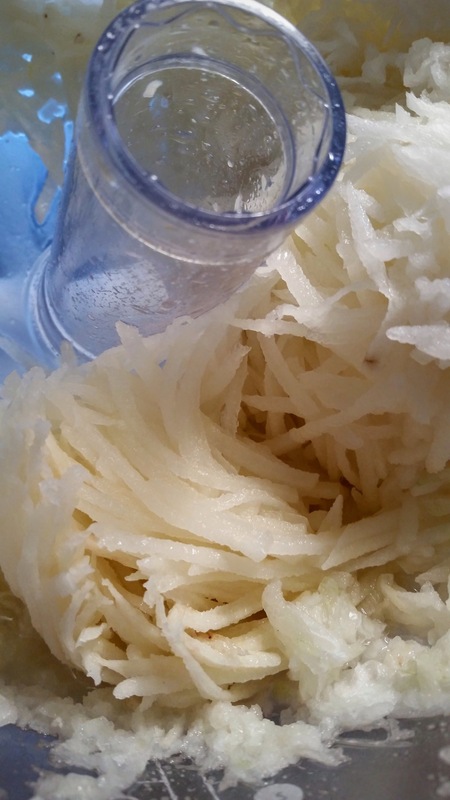 I had already grated my potato and onion in the food processor so I had a lot of squeezing to do! I let it sit in a strainer and would give it a good squeeze every 30 minutes or so. If you want to do this step ahead of time, just soak the mixture in water, to prevent browning of the potato. Next up, the cilantro, jalapeños, flour, garlic, and baking soda all get added to the potatoes and onions. Rather than using my trusty cast iron skillet, I opted for a non-stick, as I was nervous the potato mixture wouldn’t hold together. The non-stick skillet added an extra layer of protection for these beauties. Once the skillet was hot, I packed the mixture into a measuring cup (use a 1/2 or a 1/3 cup, depending on the size you’d like). I slowly added each scoop into the pan and before flattening it, slightly, I let it brown for about 15 seconds. They only need a few minutes on each side so watch them carefully. Cooking them in batches, have a plate lined with paper towels ready. I found it best to eat these immediately, for superior crunch factor but I did have success re-heating the leftovers in a toaster-oven. So there you have it. A few basic tweaks and this recipe is now tucked away in the archives under, ‘must haves’. Grate the potatoes and onions and place in a colander. Squeeze the mixture to remove excess liquid then dry with a paper towel. Heat 2 Tbsp of olive oil in a non-stick skillet, over medium-high heat. 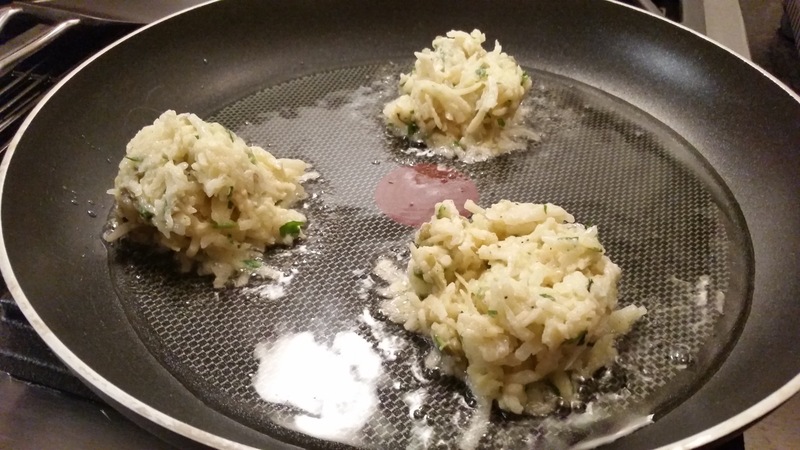 Pack the mixture into a 1/3 measuring cup and slowly invert into the hot oil. Using the back of a flat spatula, gently press the mixture into disks. Fry each side for 3-4 minutes, or until golden brown. I opted to garnish with sour cream rather than the suggested chipotle aoli but I’ll definitely try that next time. 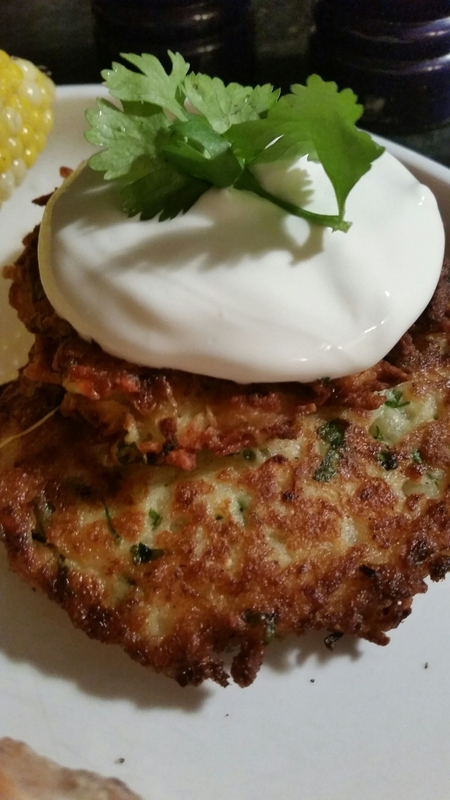 And a special shout out to Bob and Wendy Lassonde for sharing their latke secrets!